3 Is finally the span reasonable or not? At this part a simple method is presented for finding out if a carrier that is loaded with a weight at its middle has a reasonable span or not. For this purpose some simple calculations have to be performed. The presented type of loading is chosen because it is the most common loading type in constructions. For reasons of simplicity one can redraw figure1 so that figure2 results. The carrier is now a thin line. The supported edges are drawn as triangles on the brick wall. 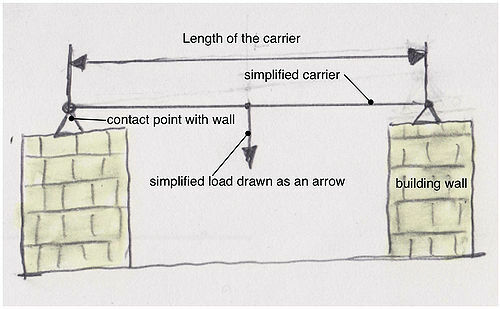 Drawing the carrier this way allows to focus more on the important values such as the carrier span and the loading drawn here as an arrow. Remember: NEVER use for a carrier concrete or similar brittle materials without reinforcement! The possibility that it will collapse is almost certain! Using the dimensions of the cross section geometry one gets a single value which forms the geometry factor (In engineering this factor is called section modulus and is also related to the area moment of inertia). For instance 120 cm^3 in which cm^3 is a unit of measure for this factor (like meters or hours would be for length and time). 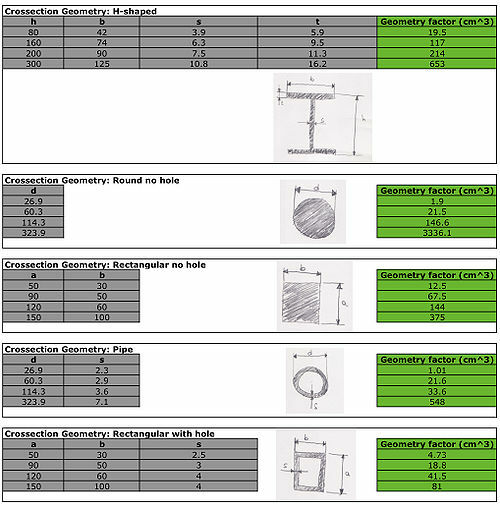 Since the calculation of this factor is difficult and time consuming tables are given for the most common cross-section geometries as can be seen in table1 highlighted with green. The detailed explanation on how the geometry factor is calculated can be found on Wikipedia: area moment of inertia. Notice that from the above mentioned cross-section geometry's the best choice concerning the weight of the carrier and its resistance to the loading in our case would be to use the "H-shaped" cross-section as for instance one can find in railroad tracks. Never the less it is more probable that you will have available tree stems or wooden carriers with round or rectangular cross-section that also do the job very good. For instance for all kind of wooden carriers: values of the material factor (tensile strength) for wood. For Steel one can take a value of 200 MPa for cast Iron and aluminum a value of 100 MPa. Notice that the calculation of a reinforced concred carrier is more complicated this is why it is omitted at this point. Is finally the span reasonable or not? In the following table some examples of different carriers loaded as seen in figure 1 are presented. 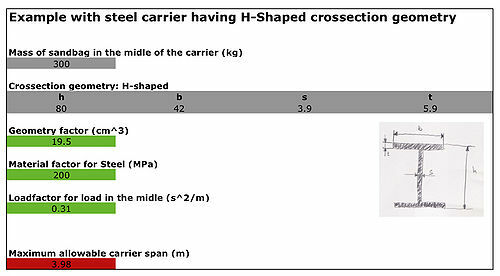 From figure 5 it results that a H-shaped carrier having the given geometry and made of steel should not exceed 3.98 meter when loaded with a sandbag of 300Kg at its middle. 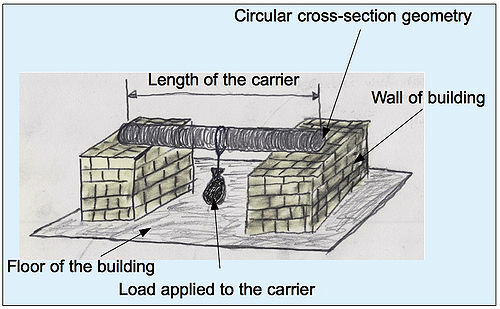 From figure 6 it results that a round carrier having the given geometry and made of would should not exceed 1.99 meters when loaded with a sandbag of 30Kg at its middle. This page was last edited on 17 April 2010, at 16:24.